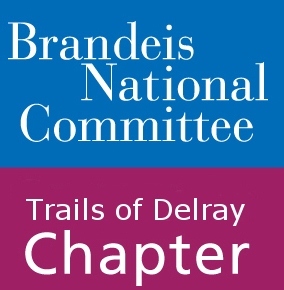 Welcome to the Trails of Delray chapter of the Brandeis National Committee! This chapter serves the Delray Beach area residents as a central hub for socialization, education advancement, social justice, and supporting Brandeis University libraries, scholarships and scientific research. Our members are a lively, vibrant group devoted to lifelong learning who draw inspiration from Brandeis values. Though some of our members are Brandeis alumni or family of alumni, many had no previous affiliation with the University. Throughout the year we provide our members with social engagements and learning opportunities in the form of study groups and special one-time events. All of our programming is designed to inform, entertain and encourage discussion. Certain events and study groups are brought to us directly from the University with materials compiled by Brandeis professors exclusively for BNC. We recognize all of our members are unique and have different interest. To accommodate this, the chapter carefully chooses study groups and across a wide range of topics to ensure there is something of interest for everyone. In past years topics have included film, literature, theater, technology, fashion, politics and current events, law, guided tours, and local attractions. One very popular event is the annual University on Wheels event where a visiting Brandeis professor presents a lecture on a topic of interest. We are always open to suggestions for future topics! BNC Trails of Delray periodically publishes a bulletin for its members highlighting dates, events, member news, and important contact information. Be sure to check the our bulletin and events page often as to not miss any updates. We look forward to seeing everyone, returning members and new members, and can’t wait to spend another exciting year learning together!